The survey projects expectations for the 1st quarter of 2012. The scale ranges from 0-100 with 0 being much worse, 100 being much better, and 50 indicating no change expected. The professional Real Estate community is considerably more optimistic. The outlook for sales (yellow) this quarter is back up into the expected expansion area at 56, a full ten point improvement from last quarter. This is approximately even with the score for the last two years at this time, it appears that there is some seasonality built in to the expectations. The national score at 48, up from 38 last quarter, indicates that respondents are fairly neutral on the overall economic picture. The participants moved to positive sentiment on the statewide conditions at 54 up 9 points from last quarter. The statewide overall score declined (see green line above). Sales expectations are more positive at 56 again up 10 points from last quarter. Inventory, price and credit indications are all below the 50 mark, indicating continued pressure on these metrics, but markedly improved from last quarter. Sellers are likely to be frustrated by competition and pricing, and buyers will continue to have problems getting financing. The sales expectations for each region are within 2 points of each other from 55-57. This quarter showed a marked improvement in all measures and in all regions. To some degree this may be a seasonal phenomena, there was a similar improvement last year. Commercial market participants (the majority of the respondents are from the Birmingham market area) moved to projecting an improving market this quarter at 54 this quarter vs. 47 last for sales expectations. Price expectations remain weak, at 45 vs 41 last quarter indicating continued pricing pressure in all markets. The score for credit availability is neutral, at 48 up 7 points from last quarter. North Alabama experienced a consistent improvement in all scores. The total score of 51, up from 42, a 9 point improvement from last quarter. Improvement was particularly noticeable in the Rural markets, where the overall score improved to 51 from 39 last quarter. The North Central Region overall score improved to 50 from 43 last quarter, The sales score improved 8 points to 55. 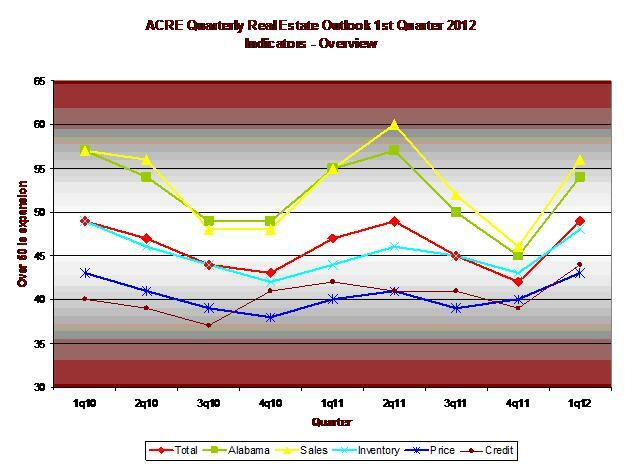 Inventory is roughly neutral at 51 with, pricing, and credit are below the 50 mark at 43, and 46 respectively. 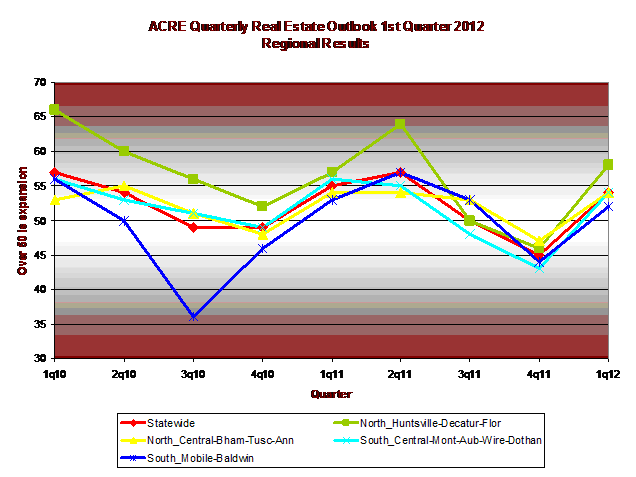 The South Central Region participants outlook for sales improved 13 points to 55. Rural participants sales expectations improved 15 points to 50. The Southern Region sales score improved 9 points to 56. Rural participants sales expectations improved 11 points to 50. The ACRE Leadership Council determined the need for a statewide industry confidence index and this was adopted as the Council’s first initiative. Tom Brander, Council Member, was selected by the Council and Grayson Glaze, ACRE Executive Director, to spearhead and work with the Center to conduct and produce its Alabama Real Estate Confidence Index (ARECI). The Council appreciates everyone who participated. This entry was posted in ACRE, Alabama, Forecast and tagged 1st quarter 2012, Alabama, Housing Statistics, real estate, regional results, seasonal phenomena, statewide conditions on January 11, 2012 by Tom Brander. If I don't think your comment adds value, I won't post it. APPRAISALSOURCE (@APPRAISALSOURCE) on That Is It Folks! Vidal on That Is It Folks!